How do I customize my Peer-to-Peer Fundraiser's goal for my campaign? From the "Overview Tab" of your "Admin Dashboard" navigate to the campaign that your fundraisers are participating in by clicking the "Campaigns" box. From the "Campaigns" tab, click the "Manage" button for the campaign you would like to work on. This will take you to your "Campaign Manager" where you'll want to navigate to the tab that says "Fundraising Champions" at the top of the page. From the "Fundraising Champions" Tab of your "Campaign Manager" click on the "Pencil" icon next to the fundraisers name whose goal you'd like to change. 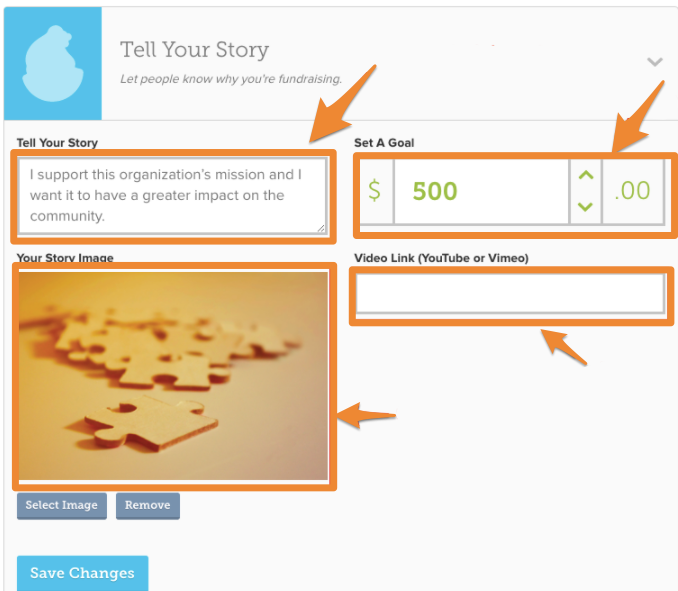 Click "Tell Your Story" to edit the fundraising goal. Click on the up or down arrows to increase or decrease your goal. You can also edit your story section, change a photo or add a video in this section. here is another great article!